Much of human inventiveness has been inspired by nature and the swift, silvery, multi-stemmed hazel teaches the art of survival through flexibility and regeneration. The more it is cut the more it rises again and again, perhaps even teaching early man the art of coppicing. It is a small shrub-like tree with large, round, serrated leaves that remain long after many trees have become bare. In autumn the leaves are bright yellow and the tree produces delicious nuts, called filberts or cobnuts depending on the species. In early spring the glorious yellow catkins of the male plant bring one of the first flashes of cheering colour. Archaeologists have been finding piles of hazelnuts wherever the hunter gatherers of the Mesolithic period made their camps. Petrified nuts keep for thousands of years in ancient bogland and pollen analysis supports this evidence. Hazels require open woodland with plenty of light in order to flourish, so their abundant presence at that time gives us clues as to the nature of the early forests of Caledonia (maybe so named after hazel or Coll) and perhaps hints at the possibility of human assistance in hazels proliferation. Of all the trees in the wildwood, hazel is the most versatile and useful. Ancient peoples would have gained much nourishment from its nuts and its strong but pliable shoots would have provided a valuable material for a range of uses. They may have been bent into domes and covered with skins, hides or reeds to make a shelter. Even in modern times hazel domes are a common temporary dwelling, usually with tarpaulin in place of skins as a waterproof cover. In more recent history we have records of hazel being used for baskets, hoops and hurdles, beaters, thatches springles, wattles, hedgestakes, fishing rods, walking sticks, dowsing rods, tool-handles, barrel hoops, wheels and coracles. However despite it’s usefulness in the last 100 years the area of Britain under coppice has fallen from ½ million acres to less than 100,000 acres as we have turned our attention to other, more convenient but often less sustainable materials. Animals love hazel too. It feeds both red and grey squirrels, wood mice, dormice and bank voles. It is possible to identify which animal has eaten the nut by observing the tooth marks. Dormice leave a smooth, round hole in the side of the nut, with tooth marks running round the inside of the hole. If you think you have found a nut eaten by a dormouse send it to The Mammal Society. Great spotted woodpeckers and nuthatches jam the nuts into crevices in order to hammer away at their shells and it provides a home for the larvae of the hazel leaf rolling beetle. Additionally hazel is the best host species in the UK for Graphidion lichens – those which grow on smooth barked trees. 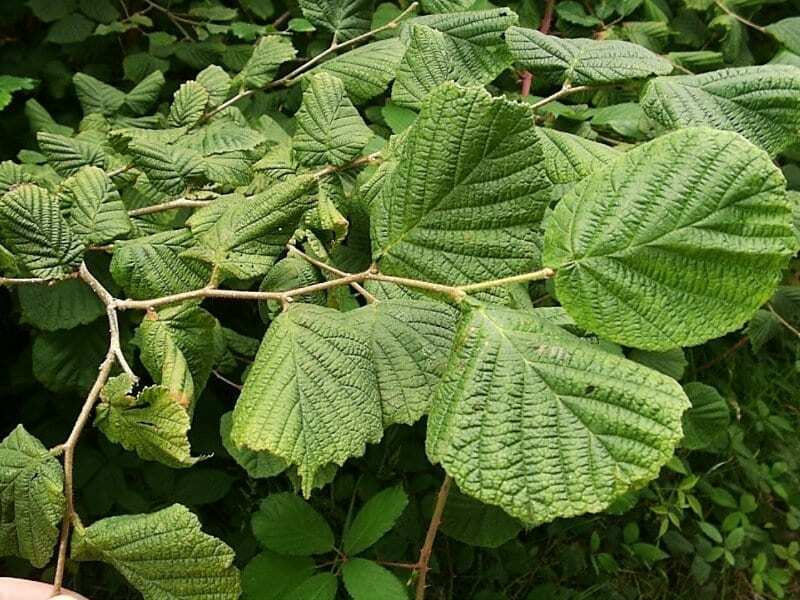 A tree long held sacred as the tree of knowledge or tree of wisdom, hazel has magical associations and is believed to be a guardian tree of the fairy realm. Many tales feature hazel in this role, including in Wales the story of a shepherd lad who cut a hazel staff from an old gnarled tree at Craig y Ddinas and walked with it to London. There he met a wise man, or dynn hysbys, who told him to return to the place he had cut the hazel bough and beneath that spot, he would find great treasure. This he did and discovered not only the 13 treasures of Britain but also the sleeping forms of Arthur and his 12 knights, under deep enchantments cast by Nimue and Merlin. There the noble warriors rest until, in the darkest hour, a raven will awaken them to fight the final battle against darkness. Hazel’s silvery stems give the impression of a leaping salmon and the most significant mythology surrounding hazel is found in the Irish tale of the Salmon of wisdom. A magical pool in the heart of Ireland is surrounded by hazel trees which drop their nuts into the pool. A salmon living in the pool eats 7 of these nuts and becomes all-knowing. Finn accidentally tastes the juice of the sacred salmon whilst preparing it for his master, thus gaining wisdom and inspiration. This also links with the tale of Taliesin in Wales. Gwion Bach who also tasted 3 drops of a magical potion prepared for another becomes similarly inspired, is consumed by Ceridwen in revenge and reborn as Taliesin, he of the shining brow. Ceridwen casts him adrift in a coracle made of hazel and he is later washed up in a salmon weir. Taliesin has clear associations with the Cambrian area and he will feature strongly in storywalks at Bwlch Corog. Salmon leap in the nearby Llyfnant river and hazel is plentiful, providing material for many traditional crafting projects as well as brightening the air with its magical, silvery stems. Perhaps it will entice us to taste the wisdom and mystery of the land and make wild leaps of imagination.